The AMX 13 90 is a French tier 9 light tank. In the early 1960s, the 75-mm gun with a muzzle velocity of 1,000 m/s was deemed outdated. The vehicle received the new 90-mm F3 gun that used more powerful HEAT shells. 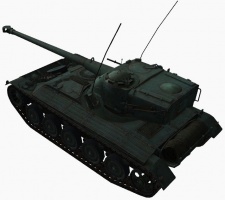 This modernization did not require any significant changes to the turret or vehicle design. The first vehicles were manufactured in February, 1967. The existing vehicles underwent the gun modernization as well. It comes with a 4 round autoloader. 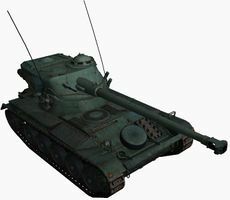 As with the the AMX 13 75, it works best waiting for engagements to occur and then flanking the enemies, firing on their sides and rear rapidly, and then fleeing to reload. 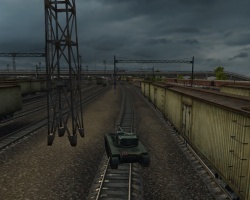 It is also fairly good at scouting and artillery killing, although it doesn't accelerate as fast as some other lights, so it should avoid stopping or slowing down when performing these roles. 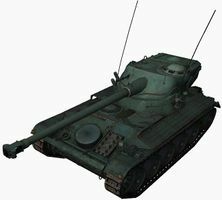 The AMX 13 90 leads to the AMX 13 105. 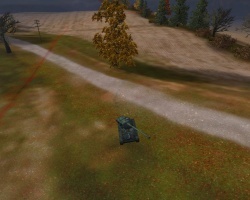 Poor accuracy on the move and during turret rotation, rather long aim time for a 90mm gun. Long grind to fully upgrade it; first gun has low penetration. Coupled with the right mindset and determination, the 13 90 can be either a rewarding tank to play, or extremely frustrating. The first thing to understand about the 13 90 is that the gun doesn't make it a medium tank, and playing it as one will bring a quick death. Despite having an auto loader, the 13 90 is not a good flanker, it has the worst on the move gun handling. The key to survival in the 13 90 is camouflage. Almost all of your time should be spent either running or behind a bush. The AMX 13 90 should strive to keep his autoloader in the fight without attracting enemy attention, as taking any fire will quickly result in a death. The only time the 13 90 should be the enemy's primary target is when he is able to quickly finish off any enemy shooting at him and able to quickly get back into cover. The AMX 13 90 has very poor gun depression and elevation. Terrain bumps and dips should be used to angle your hull up and down to allow shots that couldn't normally be made. The SCR-528F radio carry over from earlier vehicles, mount it immediatly. Then upgrade the gun to the 90mm F3 for a much needed increase in burst damage total and penetration. The suspension should be researched next. The suspension not only increases the load capacity and the traverse speed, but also improves the terrain resistances and gun handling of the vehicle. Final engine - allowing you to get up to speed and flex better around the battlefield. The AMX 13 90 is a version of the AMX-13 French light tank that was produced from 1966 to 1985. 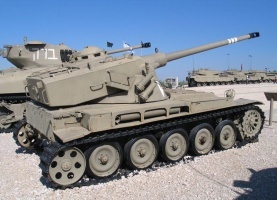 From 1966 on, the 75mm high-velocity gun was replaced by a 90 mm (the AMX-13/90) medium velocity gun firing more effective HEAT ammunition, with the French upgrading all existing base models to this specification. 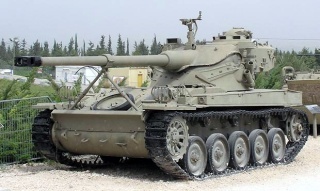 By the early 1970s export models were available with an even more potent 105mm gun. 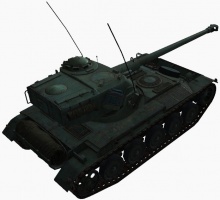 Although there were many variants on the turret the basic chassis was almost unchanged until 1985 when changes including a new diesel engine, fully automatic transmission and new hydro-pneumatic suspension were introduced. Production halted with the Model 1987. After sales support and upgrades are still offered through GIAT Industries (now Nexter). 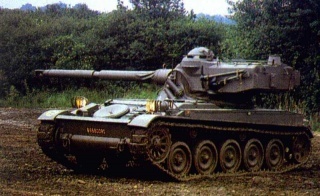 The AMX-13 tank was phased out of service with the French Army in the 1980s. Current French armoured vehicles with a similar role are the ERC 90 Sagaie and the AMX 10 RC. This page was last modified on 24 May 2018, at 18:20. This page has been accessed 496,755 times.